Learn the story behind the grandmother and grandfather rocks, shaped like body parts, near the fishing village of Hua Thanon on Koh Samui. Although to some they seem carved by fate, or as a humorous joke, these rocks nicknamed grandfather (Hin Ta) and grandmother (Hin Yai) have actually been shaped by nature into forms that resemble male and female genitalia. These genitalia-shaped rocks standing close together are not just good for a giggle at the expense of nature, but also give an insight into Thai myths and legends too. As with all attractions in Thailand, there are plenty of salespeople at this site to enchant you with their wares. After you leave the stalls hawking everything from souvenirs to food and drink, appreciate the astounding coincidence that made such unusually shaped and well-placed rocks. There is a legend about how these came to be, which no one should leave without learning. It tells the story of an older couple, Ta Kang and Yai Riam, who decided it was time for their son to wed. They set off together in a boat from Nakhon Si Thammarat to arrange a marriage with a girl from Prachuap Khiri Khan province. However, as they travelled a storm came up and wrecked them. Their bodies washed up on the coast, only to be transformed into the male and female genitalia-shaped rocks that forever spell out their intention for their son. If geological jokes are not your scene, enjoy a fresh coconut juice from one of the stalls and go for a walk along the beautiful, boulder-strewn beach, or jump in for a cooling swim. Grab a postcard or two from the stalls on your way out. Would you like to make your visit that much more special? A Full-Day Guided Sightseeing Tour of Ko Samui and a Photographer's tour - English Speaking Guide takes you to great spots and allows you all the time to set up and snap are both worth looking into. 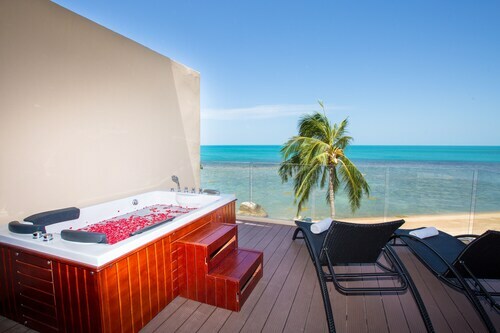 If you'd like more activities, have a look at our Koh Samui things to do page. Marvel at the body of a mummified monk in addition to the opulent art and sculptures at this revered temple. Visit this elegant pagoda and its nearby shrines, which make up a temple complex at the southernmost tip of Koh Samui. Jutting out from the west coast of the island, this busy pier is the main entry and exit point for visitors to Koh Samui. A huge Guanyin goddess and a laughing Buddha are impressive features of this extravagant temple built in the Thai-Chinese style. Snap photos of the large golden Buddha sculpture that welcomes you to this intriguing dock of opulence and spirituality. Isolated and laid-back in the southwest of Koh Samui this is the perfect spot for a secluded getaway. Resting high on its own islet, this large golden seated Buddha watches over the island of Koh Samui and is one of the area’s most visited attractions. 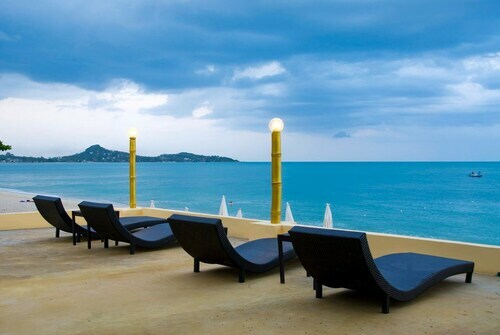 This beach on Koh Samui’s north coast is a favorite of the young and trendy. Enjoy an invigorating swim in natural pools while admiring lush vegetation and striking rock formations at this pair of beautiful waterfalls. This bay is home to one the main fishing villages in Koh Samui. Colorful boats and spectacular views to neighboring islands all complement this pristine area. If you want to catch a glimpse of Koh Samui before tourism development, visit this wonderfully well-kept street of 19th-century Chinese shop-houses and French architecture. Explore a more traditional way of life in one of Koh Samui’s oldest villages. Find Chinese teahouses, funky bars, and a distinctly Mediterranean feel. 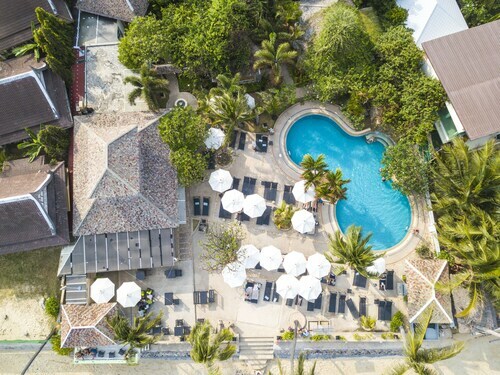 Relax on one of Koh Samui’s most beautiful beaches, enjoy a massage in one of the many resorts and explore the surrounding picturesque fishing villages and temples. A quieter neighbor to one of Koh Samui’s busiest beaches, this is the place to simply laze about in the water or lie in the sun. Set amid swaying palm trees and turquoise water is this postcard-perfect beach is ideal for relaxing on soft golden sand, swimming in warm water and enjoying breathtaking sunrises. Marvel at the fascinating array of Buddha statues, animal sculptures, tall trees and tropical plants that decorate this serene hilltop garden. This beach is where you’ll find coconut trees, beachfront villas and not much else. 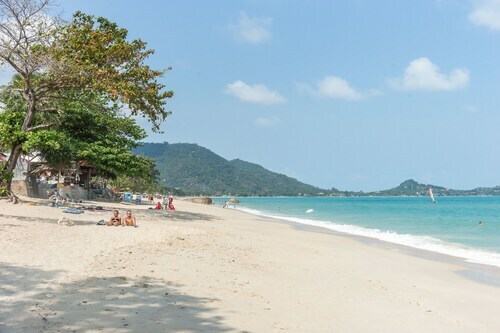 This beach is part of the more upmarket and exclusive northeastern coast of Koh Samui with secluded resorts with private beaches. Wonderful property with great service. The breakfast was incredible. The pool and views were so nice! Unfortunately when we went the ocean was too rough to swim in at that particular location. 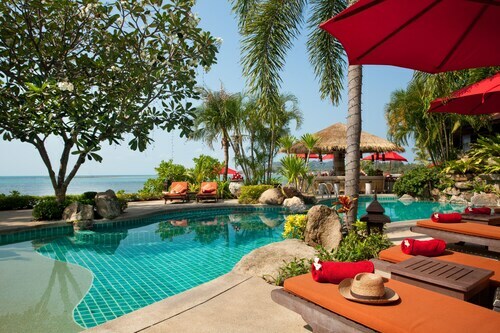 Nice hotel on the beach. The rooms are spacious, hotel is very clean, buffet breakfast is standard and beach is just the way I like it. 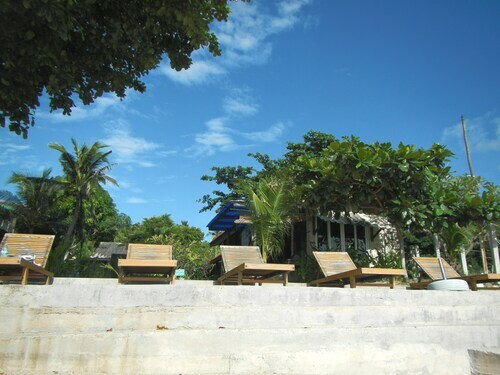 Set in pretty garden close to sandy cove, rocks for snorkelling around and a long, sandy beach. Close to shops and restaurants of all kinds, old and new. Lovely staff, run by lady who owns it and who made us feel like family. Thank you, Poom!